Brush cut sides of lettuce, both sides of onion slices, and both sides of bread with vegetable oil and season with salt and pepper. Season steak with salt and pepper. Grill steak directly over hot fire until well browned and internal temperature registers 125 degrees(medium rare), 4 to 6 minutes per side. Transfer to cutting board and tent with foil. Meanwhile, grill onion slices around perimeter of grill until lightly browned and soft, 7 minutes per side, then transfer to platter. Grill lettuce on cut side only, with root ends in center of grill and leaves extended to perimeter of grill, until grill marks form, about 2 minutes. Transfer lettuce to platter and cut in half again, making 8 pieces. Grill bread until lightly browned, 1 to 2 minutes per side and transfer to platter. Combine vinegar and mustard in medium bowl. Slowly whisk in olive oil and season with salt and pepper. Slice steak thin against grain. 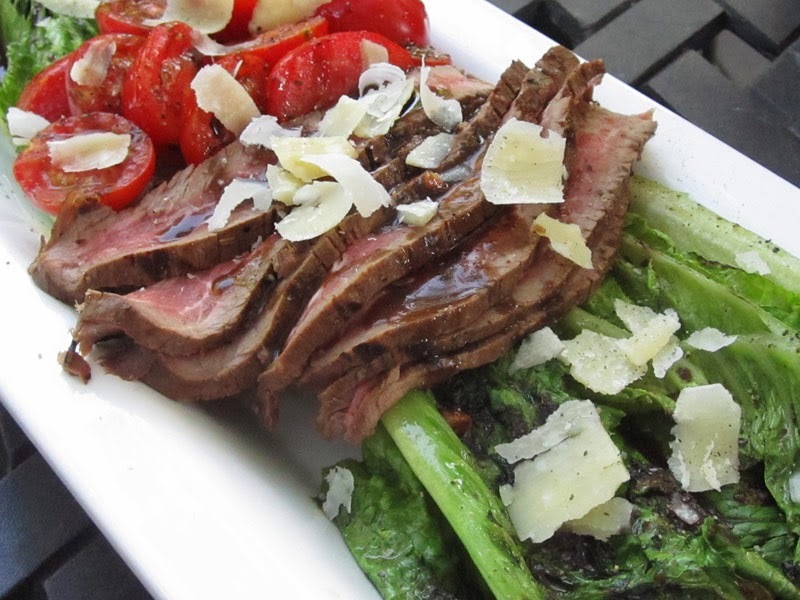 Arrange 1 slice bread on each serving plate and top each piece with sliced steak. 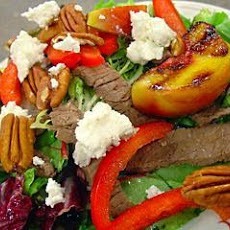 Arrange 2 lettuce wedges beside each slice bread and drizzle steak and lettuce with dressing. Sprinkle onion slices and blue cheese on top of steak and lettuce. Serve.